Adam Hinshelwood says Worthing must quickly forget about missing out on a spot in the FA Cup first round. Worthing went down 4-0 in a fourth round qualifying tie at two-divisions higher National League outfit Ebbsfleet United on Saturday as they failed in a bid to reach the first round proper of English football's oldest cup competition for the first time since 1999. But Fleet failed to impress and the final scoreline flattered the Kent side. Worthing missed a whole host of opportunities and a day to forget was capped when red-hot striker David Ajiboye had a penalty saved by Ebbsfleet goalkeeper Nathan Ashmore late on. However boss Hinshelwood saw enough from his side to give them confidence as they now look ahead to a FA Trophy tie and hope to push for promotion in the Bostik League Premier Division. 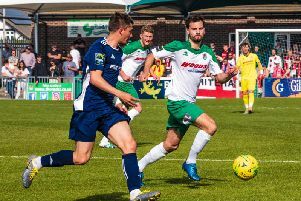 The FA Cup defeat will quickly be forgotten should Worthing progress past rivals Burgess Hill at Leylands Park in a first round qualifying Trophy tie this weekend. While the club are well positioned in the league, currently sitting fifth with games in hand on teams above them, as they look to reach the National League level this term. Hinshelwood said: “There can’t be any sort of hangover on the back of this (the Ebbsfleet FA Cup defeat), if anything we should be full of belief in the way we play. “To go to a place like Ebbsfleet, a team two leagues above, and create the chances that we did and play the football we did, there is lots to be pleased with. “It’s important we bounce back, lick our wounds and learn from it.